If you are looking for information on the ShapeXpress franchise business opportunity, Shape Express franchises or Shape Xpress franchising, then you have come to the right place. ShapeXpress offers a dynamic fitness franchise opportunity in an expanding industry with significant income potential. Take advantage now of the growth in the fitness industry's fastest growing segment, women's only fitness franchise. "A premier women's only fitness club"
ShapeXpress, founded in September 2002, has had almost unprecedented growth and success within the franchise industry In just 2.5 years ShapeXpress has become one of the fastest growing franchises in America. We have sold over 250 franchise licenses, opened over 60 fitness clubs in 26 states and were recently included in Entrepreneur Magazine's 2005 Hot List of Franchises. ShapeXpress is a win-win franchise opportunity that can quickly provide positive cash flow from a total start up investment of as little as 95K and operate with only 3 to 4 employees on staff, while providing you the owner recurring "residual" income from your business. How were we able to produce such outstanding results so quickly? There are 5 main reasons' why ShapeXpress and our franchisee's have experienced so much success so quickly. When you become a ShapeXpress Franchisee our entire support team is immediately engaged to assist you in every area of training, staffing, opening, operating, marketing, and membership sales of your ShapeXpress Fitness Club. We have divided our ShapeXpress Franchise Support Team into three departments; Operations Support; Marketing & Membership Sales Support; and Marketing Production Support. In addition to our Franchise Support Team, our franchisees benefit from intensive, comprehensive FREE 5 day training. In the last several years women's only fitness has become the fastest growing segment of the dynamic health and fitness industry. Yet with a potential market of 122 million women, this industry is anything but saturated. ShapeXpress is setting the standard for women's only fitness clubs. Other women's only fitness clubs are small and one dimensional, offering little more than a small circuit of equipment. While ShapeXpress isn't an impersonal mega club of 10,000-20,000 sq. ft. (a ShapeXpress averages about 2600 sq. ft.), our clubs are big enough and designed to allow for a full service fitness facility with many different services and programs to meet the needs of today's women. A ShapeXpress Club has an upscale spa-like environment that adds value and spa-type services that add multiple streams of revenue. With distinctive interior design, fun upbeat music, professional cue tape and personal fitness instructors providing individual attention to members, a ShapeXpress Club creates loyalty, renewals and referrals. Though ShapeXpress was founded in 2002, President and CEO Linden Wood had already founded 2 other successful businesses in the 8 years previous. The original company already had the sales, marketing and operations infrastructure and experience in place to launch a dynamic new company - ShapeXpress. As a franchisee, you will benefit directly from that entrepreneurial and business experience. In 2003, total annual fitness industry revenues were $14.1 billion ... and growing strong. The number of health clubs and gyms in the U.S. has increased consistently over the past five years, up 39 percent since 1997. There has been a 63 percent increase in gym membership from 1990-2001, and a corresponding jump of 104 percent in frequent participants who worked out at a club at least 100+ times in a year. Strength training is one of the fastest growing fitness activities with nearly 20 million Americans now performing this activity at least 100+ days a year ... a figure that represents 53 percent growth over the past 10 years. 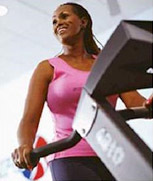 From 1987-2001, the number of Americans who exercised 100+ days a year on cardio equipment (i.e. treadmills, stationary bikes, stair-climbers, rowers, etc.) increased from nine million to over 18 million. We have expressly designed ShapeXpress® Fitness Clubs to meet the needs of today's active women, offering a refuge from everyday stress and - with just 30 minutes per session - fitting easily into even the most hectic lifestyles. ShapeXpress® allows you to provide a positive alternative for women who are not comfortable in a traditional co-ed gym setting but still want and need the health and fitness benefits of regular exercise. Choose from among the diverse revenue streams available from ShapeXpress® - including tanning, therapeutic dry sauna, nutritional product sales, exercise classes and more - and you may quickly capitalize on multiple revenue streams! Just imagine multiplying this earning potential across several ShapeXpress® locations! Who is a ShapeXpress Franchisee? In America, obesity is the number one health concern facing the nation. This astonishing problem has created a high level of consciousness, propelling society to find a solution. This is the driving factor generating a $600 Billion industry. Included in these numbers are the growing demands for facilities solely devoted to women. Industry studies have determined that 90 percent of women prefer women's only fitness centers to coed gyms. As you can see, now is a great time to take advantage of the growth in the fitness industry. Membership is not the only source of revenue. ShapeXpress Inc., a premier women's only fitness club, also includes tanning, therapeutic sauna and massage. These amenities, with our décor and environment, produce a spa like atmosphere. In addition, ShapeXpress offers an exclusive line of nutritional products to help women reach their weight loss goals. 68% of Americans are overweight, while 27% are obese and these numbers are increasing, however, the ShapeXpress target is 90% of all women. Fitness is one of the fastest growing industries in America. Currently there are only 3 million women that are active members at a women's only fitness facility. The number of qualified women is up to 125 million, meaning endless opportunity. The corporate office provides ongoing support to all franchisees. This includes weekly conference calls with marketing support executives, operations support executives and other leadership team members. There are also weekly follow up calls for personal assistance with each club. The in-house marketing department has developed an interactive website for downloading of marketing materials. This allows the franchisee to be in control of marketing material. For additional support, a full in house advertising department is available to assist with advertisements and any other marketing items needed. When you search for a sound business opportunity, you want to find consumer interest and a market with endurance. These qualities are present in the industry of women's health and fitness. ShapeXpress wants to improve the quality of life for women and we want to make our franchisees successful, because their success is the only way to measure ours. ShapeXpress clubs are different, designed expressly with women's needs in mind and based upon an effective, efficient workout that easily fits into today's hectic lifestyles With a business model that delivers multiple streams of revenue based upon established consumer buying habits and residual income over time with contractual memberships. Our superior product means ShapeXpress clubs attract and keep members. ShapeXpress is one of the fastest growing franchises in the U.S.
ShapeXpress has sold over 250 franchises in our first 2 years.